In 4-quart saucepan, heat oil over medium heat. Add onion, garlic and chiles; cook 3 to 4 minutes, stirring occasionally, until tender. Stir in beans, tomatoes, broth and cumin. Heat to boiling over high heat. Reduce heat to medium-low; cover and simmer 15 minutes. Remove from heat. Using a potato masher, mash beans until soup reaches desired consistency. Stir in cilantro. Top individual servings with yogurt; serve with lime wedges. 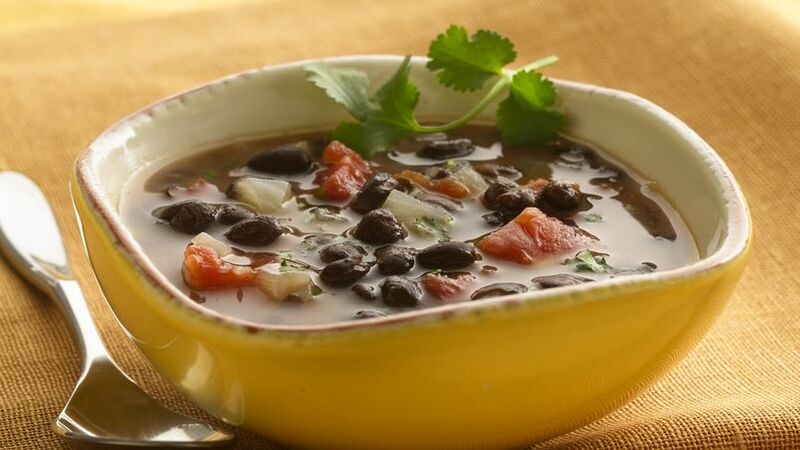 Black beans are loaded with fiber--the soluble kind that helps to lower blood cholesterol. Start slowly so you have time to get used to more fiber! Fiber-rich beans star in a tomato-packed spicy soup.